Acquire from us a vigilant guard of female health! We have a strong foothold as Manufacturer, Supplier and Exporter of Pain Relief Medicines in Rajasthan, India. Ours is a powerful non-hormonal herbal combination. 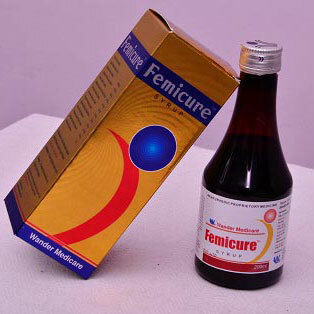 The Femicure Syrup is quality approved and hence re-establishes the normal functions. In addition to this, it is also highly effective in weakness, menstrual disorders, anaemia, fatigue, leucorrhoea & indigestion. We make sure that the placed order is delivered safely and on time. © Copyright 2009 - 2010. Khandelwal Ayurved Bhawan Pvt. Ltd.